Dispensaries are staples of the cannabis industry. This is where customers go to buy medical and recreational cannabis. Without these key players, there would be no retail outlet for cannabis consumers. After all, Wal-Mart isn’t carrying anyone’s favorite line of Kush. Not yet at least. While dispensaries are important and highly visible in the distribution channel, they are also turning out to be one of the most profitable sub industries in the cannabis sector. Dispensaries on the whole are doing well. And awesome in some cases. According to a report from Marijuana Business Daily in mid-2016, almost 90% of cannabis dispensaries are profitable or breaking even. Take a look at the chart below. 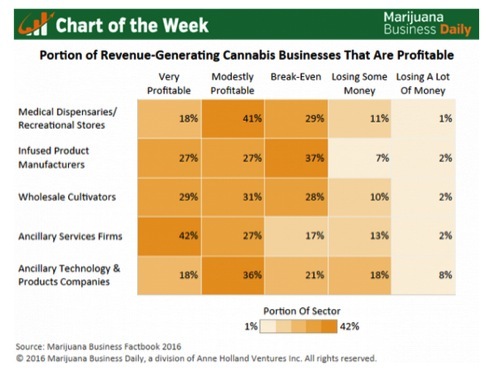 What you can also see is that from the five cannabis sub-industries – dispensaries rank near the top in percent of profitable companies. Cannabis dispensaries don’t just rank high against other cannabis sub-industries. They also rank high in profit per square foot against the broader retail sector. The average annual revenue per square foot for a U.S. dispensary was just under $1,000 in 2016. Take a look below. This impressive data has many investors eager to invest in cannabis stocks that own dispensaries. Unfortunately, it hasn’t been easy. In early 2016, U.S. based cannabis company Terra Tech (OTC: TRTC) became the first publicly traded company to own a dispensary. It acquired Blum Oakland, an Oakland based dispensary with more than 42,000 registered patients for $21 million. This was big news in the cannabis industry and for cannabis investors. It marked the first time investors could buy a cannabis stock that owned a dispensary. Since then, Terra Tech has continued adding to its portfolio of dispensaries. It currently owns and operates two more dispensaries in Las Vegas with plans to build two more, one in Reno and another in Las Vegas, by the end of the year. Clearly, Terra Tech sees opportunity in dispensaries. The company is making a strong move to be an early leader with a recognizable and scalable brand. Today, Terra Tech is being joined by a new player in the industry – giving investors a 2nd cannabis stock to choose from in the dispensary space and the only cannabis stock in the world that I know of that offers “pure play” exposure to dispensaries. Shares of this little-known company are up 218% in the last 12 months. And with sales expected to hit a new all-time high in 2017, I am expecting more. Kaya Holdings (OTC: KAYS) owns two cannabis dispensaries called the Kaya Shack in Oregon. One is located in Portland and the other is located in South Salem. Kaya began trading as a cannabis company on April 7, 2015 through a reverse merger. Like they say in real estate ,oe it’s all about location, location, location. Kaya chose a good location to develop its line of Kaya Shack dispensaries. Oregon is one of the most progressive states for legal cannabis, with both medical and recreational legalized. Kaya claims to be the first vertically integrated cannabis company. That means it cultivates the cannabis products it sells at its dispensaries. Terra Tech also claims to be the first vertically integrated cannabis company. I don’t know who is right. I don’t think it matters. Either way, vertical integration is a good thing. When dispensaries grow their own stuff it can increase profit margins. Both Kaya and Terra Tech are early movers into this business model. Despite this similarity, there is a key difference between Terra Tech and Kaya that everyone needs to understand. Although Terra Tech has a lot more square footage in the dispensary space than Kaya, it also owns other business lines. Its dispensary revenue only represents a portion of total company revenue. On the flip side, almost all of Kaya’s revenue comes from its dispensaries. This makes Kaya the only cannabis stock in the world that offers “pure play” exposure to dispensaries. That’s one of the reasons Kaya has been on a roll. Revenue for the first nine months ended September 30, 2016 came in at $754,000, up 737% from $91,000 in the same period last year. 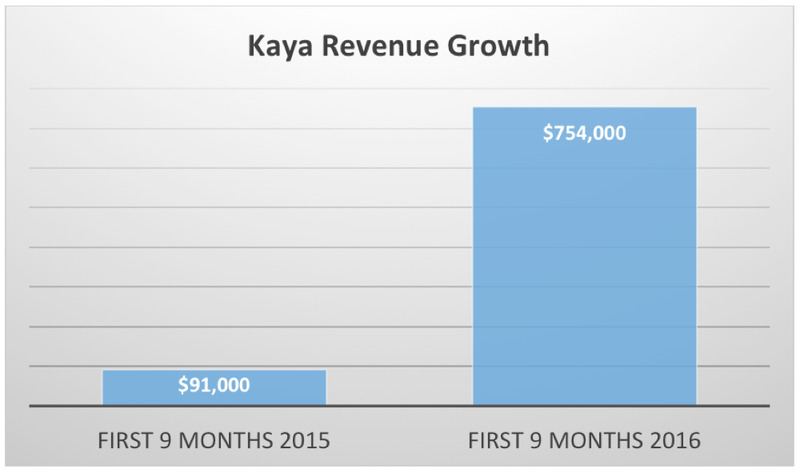 As of its last reporting period ending September 30, Kaya was not yet profitable. This will be a theme in the young cannabis industry and I don’t view this as unusual or a bearish signal. Make no doubt – Kaya is tiny. The company has a market cap of just $31 million. That is less than 3% of Canopy Growth Corp’s (CGC) market cap of $1.1 billion, the largest medical marijuana company in Canada. Terra Tech has a market cap of $160 million. On the chart, although Kaya is up 217% in the last 12 months, shares are trading 30% below the recent all-time high. 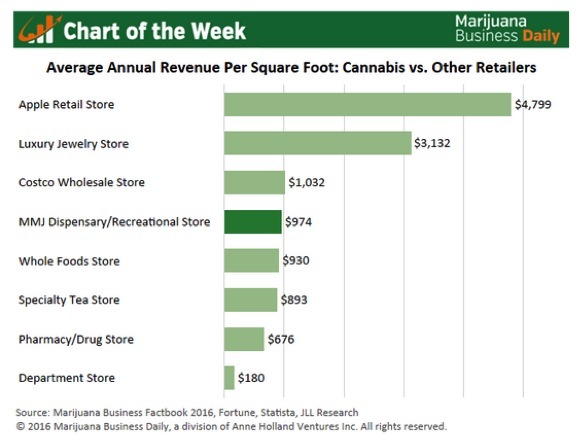 Much like the broader retail sector, bigger is better for dispensaries. Scalability enables retailers to lower expenses and increase profit margins. Kaya needs to scale its operations as quickly as possible and continue grabbing more market share. Kaya is the only cannabis stock in the world I know of that offers pure play exposure to the dispensary industry. With a market cap of just $31 million, it’s a micro-cap and smaller than many privately owned businesses. I view Kaya as high-risk, high reward. Look to buy shares on dips and pullbacks and hold for the long haul. Disclosure: At the time of original publishing, Michael Vodicka owned/owns shares of Terra Tech (TRTC), Canopy Growth Corp (CGC), and Kaya Holdings (OTC: KAYS).